Stile & Rail Ready-to-Cut Profiles are the most recent hardwood product offering from S4Shardwoods.com by Thomas & Proetz. It’s the latest example of successfully adapting to market trends for over a century. That experience means we understand why premium cabinet makers demand the very best in Stile & Rail production. We also understand cabinet manufacturers constantly strive to lower their waste factor & overhead. We know how Cabinet Makers can increase productivity and profits by eliminating the labor intensive steps of manufacturing in-house. Outsource that production to a trusted partner that provides the quality products and value added services you deserve. That partner is S4Shardwoods.com. 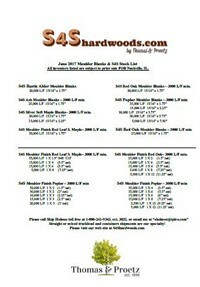 Like all our hardwood products, S4Shardwoods.com Stile & Rail Ready-to-Cut Profiles are of the highest quality. Our ongoing investments in machinery, facilities, inventory, supply-chain, personnel, and training allow us to provide a customized solution that suits the unique needs of every customer. Choose S4Shardwoods.com for all your Stile & Rail needs. We offer stock Stile & Rail Profiles and can custom match your existing “repeatable” profile upon request. Available in Cherry, Red Leaf Soft Maple, Poplar, and Red Oak. Other domestic or import species available upon request.